This is a common fungus, Armillaria species. It is often found amongst the remnants of dead plants and is extremely clever at existing and surviving on the roots of otherwise healthy plants. Very easily it can spread, causing havoc to the plants and foliage around by coming into direct contact via their roots. Often the plants that are under threat of contracting Honey Fungus, are those who have compromised growing conditions. There are a host of plants that are more susceptible to contract Honey Fungus than others. By producing spores the fungus will spread further afield, effecting woody and herbaceous plants along with other species such as conifer tree stumps. Honey Fungus comes in a variety of species and recognising them apart can be difficult. Sometimes you’ll only know when the fungus is present by its appearance in the form of toadstools during the autumn months. They can be distinguished by their light coloured stems and growing in clusters at the base of their victims. Their stems can grow up to 15cm and the honey coloured caps are between 5-7cm. Another distinguishing mark is that they have a white coloured ring, a bit like a collar, just below the cap. If you pull back the bark to reveal the wood of a tree where the fungus appears, you’ll be able to smell a strong and distinctive mushroom aroma. Often the affected roots will be very wet and you’ll see that they have started to rot. Most of the fungus and the problems it causes is happening below the soil, but you’ll know of its presence above ground when plants start to die off. Once you know for sure that Honey Fungus is present, you must remove and dig up all of your dead plants including any stumps if you can. You want to destroy as much of fungus as you can and eliminate it from your garden so that it doesn’t return. Stumps that haven’t been removed and are left, can be sitting targets for Honey Fungus in the future. This is where the necessity for stump grinding comes into play. By grinding the stump away and removing as much of it as possible, you are reducing the chances of Honey Fungus returning. Improve your plants chances of survival; ensure there is good drainage and that soil is rich in nutrients. 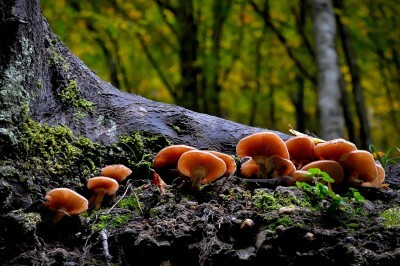 It is thought that by having other fungi present , Honey Fungus can be deterred from growing. Think carefully when deciding what to replant in areas where Honey Fungus has grown in the past. The following list may be of some help.